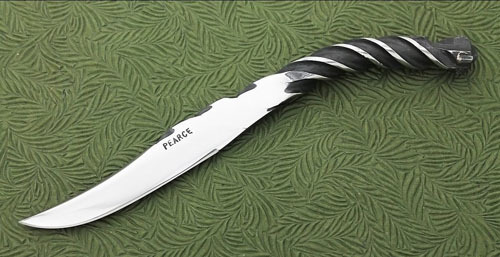 I like a knife maker who displays their knives on pretty backgrounds. This is the work of Logan Pearce of De Queen, Arizona. He's following in the footsteps of his late grandfather, Perry Pearce, who specialized in making knives and tools out of ordinary objects like wrenches, horseshoes, rebar and railroad spikes. I found Logan via uncrate.com the other day- a great guy's site to add to your bookmarks. Heating up metal to high temps in a gas forge or coal fire, Logan forges all of his knives in a traditional manner, crafting each into shape with a hammer. 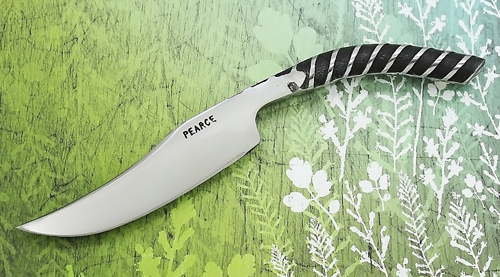 The best part is how affordable these knives are, ranging in price from $20-$75. I love a well priced gift that is also one of a kind and beautifully made by hand. 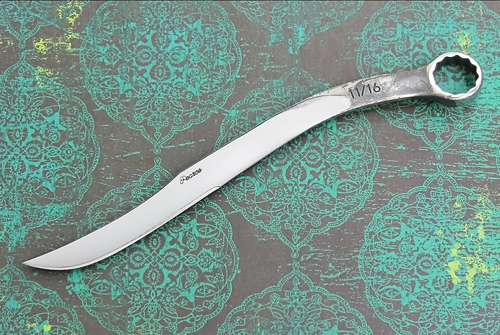 Logan's most popular knives are made of railroad spikes, which he sells all over the world. He's making his grandpops very proud. See all of Logan's impressive handiwork here.